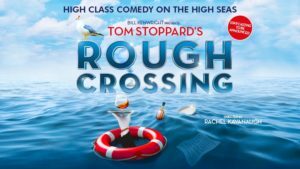 Bill Kenwright presents a brand new production of one of the most hilarious and brilliant plays by Tom Stoppard, Tony and Oscar award-winning writer of Arcadia, Travesties and Rosencrantz & Guildenstern Are Dead. Two famous but desperate playwrights are stuck on an Ocean liner headed for New York, feverishly trying to rehearse their latest show before reaching land, and opening night. But they are constantly distracted by their delicate composer’s attempts to end it all, having overheard his lover confess her feelings to the leading man. Add an absurdly unorthodox waiter, a mistimed lifeboat drill and a vanishing glass of brandy and soon the sharp Atlantic winds turn to world-class gales of laughter as these colourful characters become tangled up in a typically Stoppardian string of absurd events.